I have always been interested in science. But as a child, I was primarily interested in the medical sciences. My father was a doctor. I spent a lot of time in hospitals, worked in his office, worked in laboratories, and thought I would go to medical school. I was always involved in science courses, science projects for kids, summer science. But in college, I had a second love. I was interested in literature and writing. I tried to balance both science and writing in college, but discovered I was having a lot more fun in literature and writing. I enjoyed writing of all types; journalism, creative writing, you name it. I was writing for the newspaper, and became feature editor. So although I kept taking science throughout college, I ended up majoring in English and thought that perhaps I would become a science writer. How did you become interested again in pursuing a career in science? When I graduated from college, I tried being a science writer for a little while. I wrote for some local papers and trade magazines, but I couldn’t pay the bills. So I took a job as a technician working in a physiology laboratory at the Columbia University medical school. I worked for a wonderful man. He allowed me to join the laboratory on various field research projects, including studying a monkey colony in Puerto Rico. I took part in everything in the laboratory; writing proposals, doing the experiments, writing up the results and presenting them at meetings. I was an author and a first author on the two papers published during my time there. I learned that I absolutely loved the life of research. I became less and less interested in continuing in medical research for a variety of reasons. Part of it had to do with experimenting with animals, which I know is a necessary part of medical research. Then I just happened to meet a group of geologists. I had never taken a geology course as an undergraduate. But to me it seemed like the most wonderful life because not only did you get to do science, you got to travel. Geology is one of those sciences where if you have a good background in math and physics and chemistry and biology, you can pick it up relatively quickly. It really just takes knowing the basics and applying it to geological examples. Working at the medical school, I got tuition credits to take courses at Columbia. So I took courses in geology and made up about half of the undergraduate major. I then applied to graduate school and was accepted just about everywhere I applied, including Columbia where I ended up going. I was probably one of the most unusual applications they had ever seen. I submitted reprints on ocular physiology. During my three years as a technician, I had really honed my laboratory skills. So I went into geochemistry because I had skills in that. Once you got your degree, how did you pursue your career? I worked with a guy named Charlie Langmuir at Columbia. We produced a lot of really good papers that really put my name out there. So when I graduated, I had a number of job and postdoc offers. But I was 33. I had gotten married to a geologist and really wanted to have kids right away and didn’t want to take the route of getting a postdoc then moving again. I was really looking for a faculty position. I also felt strongly that I wanted to teach undergraduates. I thought I would be really good at it. I was therefore ecstatic when Duke offered me a faculty job. One day I was at Lamont depositing my thesis, and three days later I was teaching here at Duke. It would have been easier to get my research program going if I had the luxury of doing a postdoc. Somehow it all worked out though. I have good support here at Duke, and good support from a patient husband, and two great kids. I had my son Jeremy the year after I arrived here and my daughter Alexis a few years later, all in the pre-tenure years. And somehow it all worked out. What challenges have you faced as a woman in your career? Particularly in the early years of your career it’s necessary to be out there in the community, to travel, to give talks, to travel to conferences, to really build up your standing in the community. So when you have a family that you are also trying to nurture, there’s always an inevitable push-pull between the amount of time you spend at work and on the road and the time you need to be home caring for your family. All I can say is that I tried very hard to limit the invitations I accepted, but I had to have a very supportive home life to do what I needed to do and be out there and be an active member of the community. It takes a certain amount of support in that regard from your immediate and extended family. When I would go away to sea, it was a big production. My parents would come for a while, my husband’s parents would come for a while. It involved quite an effort at home when the kids were younger. Talk about the importance of teaching undergraduates. I love teaching undergraduates. They are open to ideas. They question. They think things through. They want to be exposed to things they have never done before. There is nothing I like better than taking students who have never been out in the field and asking them to look at the world through new eyes, to trek through the mud when they have never done it before. All of those things are thrilling to me. I’m also the director of undergraduate studies for the earth and ocean science and environment majors. I love advising the students and figuring out the paths they want to take in their lives. Not all of them will become earth or environmental scientists. But a significant proportion will. And it’s really thrilling to see them go off and do interesting exciting things. I’m also co-chair of the Baldwin Scholars Program, which is a leadership development program for undergraduate women at Duke. 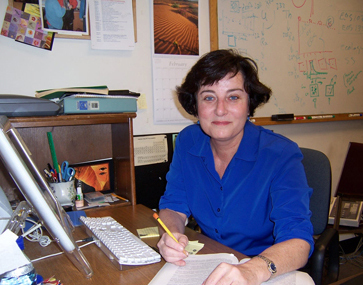 I have a particular interest in helping undergraduate women who are interested in science. We all know that women become discouraged and drop out of the sciences at basically every level every year. I have a particular goal of trying to help students through what can be challenging times. What about your work continues to inspire you? Every time we go out to sea, there are surprises. I have never had a cruise where there wasn’t an extraordinary surprise that turned on its ear what I was expecting. Maybe I have been lucky in that regard or maybe that is typical. I’m not sure. But that has always come to pass. So once again I am looking forward to something I don’t anticipate that will lead us on some new and interesting direction to explain the earth and how it works. That’s what excites me about the research. About teaching. I think geology is evolving and now encompasses a spectrum of issues that range from pure geologic science to environmental science. Increasingly I find that students are particularly interested in seeing the potential societal impact of the earth processes they are studying. Making that transition from thinking of geochemistry as strictly studying the ocean floor, to thinking about ways that geochemistry impacts climate change and other environmental threats, is something that many of us in basic earth sciences are starting to spend more time trying to get a handle on. There will always be an aspect of science that is basic science without any direct societal impact. But increasingly we are trying to make those connections to how the science affects our environment and the world around us. 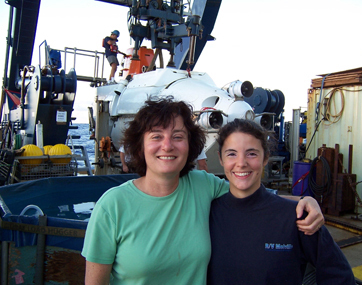 What advice would you have for women interested in pursuing a career in oceanography? I read a great deal. For a while (several years) I only read histories about great explorations—Shackleton, Cook, the Apollo missions. I also am a New York Times crossword puzzle addict. I must do the puzzle everyday, except Monday which is too easy!